A week into 2011 and a first, if short, hill walk. A bad cold over New Year has prevented earlier outings. 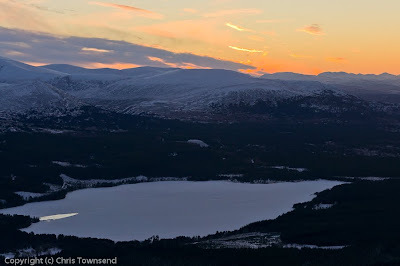 Today I had a morning meeting at Glenmore Lodge so what better than a stroll up Meall a’Bhuachaille in the afternoon? Staring out of the lodge windows at the mountains shining in the sun I was longing to be out there in the snow. It was time to test just how much my cold was fading. Everywhere was frozen hard and the air had that biting frosty deep winter feel as I set out. The temperature had been -9ºC when I left home. The track through Ryvoan Pass and above Lochain Uaine was a wide thick band of ice in places. I thought about crampons but decided to edge along the heathery sides until a dusting of snow appeared to dull the slipperiness. The air was calm and the sun bright though I could feel no heat from it. Shaded Lochain Uaine was completely frozen over. Some one had cut a hole in the ice. It had frozen again but blocks of ice eight inches thick had been left on the edge. Further on little Ryvoan Bothy shone gold in the rays of the low sun shining straight through Ryvoan Pass onto its walls. I crunched up the snowy path to the summit of Meall a’Bhuachaille. Part way up a chilly westerly wind swept across the slopes but it had gone before I reached the top. At the cairn I paused and stared out over the pale Cairngorms. The sun was close to setting and the clouds in the west were turning orange and red. Frozen Loch Morlich was a dull white against the dark forest with just a splash of silver where a streak of open water lay at one end. The descent was a mixture of skidding on icy patches and trudging through ankle deep drifts. I considered crampons again but the ice never lasted long. I was glad I had them with me though. By the time I reached the forest again the light had almost gone, with just a dull red glow in the western sky. A thin crescent moon was bright against the deep blue. A short walk only but a fine one to start the year, with perfect winter weather. Back home the layouts of my next book, a photographic record of a year in the Cairngorms, had arrived. 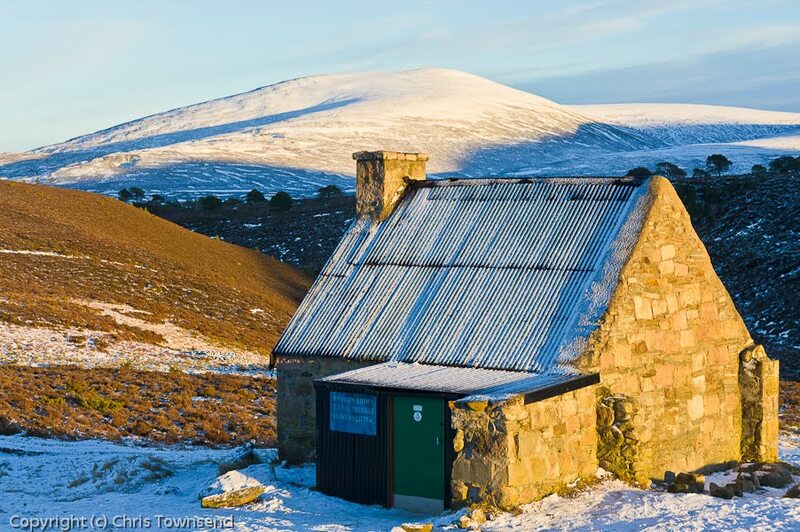 There was Ryvoan Bothy in summer, surrounded by heather and brown hills. How different it had been today. Glancing through the layouts and feeling pleased with the design work of the publishers I realised something about the pictures and about my day out. A distinct lack of wind turbines. With Dunmaglass in mind and the likelihood of more wind farms to come I wonder how long my photos will be an accurate portrayal of the landscape. Photo Info: Top: After sunset, Loch Morlich and the Cairngorms from the western slopes of Meall a’Bhuachaille, January 7, 2011. Botton: Ryvoan Bothy and Creag Mhor. Sony NEX-5, Sony 18-55 lens@50 & 55mm, 1/125 & 100@f8, ISO 200, raw files processed in Lightroom 3. That's a heartbreaking piece, Chris. We are letting the politicians of every hue screw up the places we go to for refreshment. These slime-balls should be dragged out onto the wintery hillsides in their vests and pants to feel the real power of nature in the depth of winter. The turbines won't save their skins. (word = "nonsces" - so apt! Not very long I fear Chris, but even more important, therefore, that you've captured the landscape as it is now - for us all. Thanks. Chris, I missed out on a Christmas backpack, down with a bad cold as well! Chris I feel so sad about the potential loss of our wild places. I am afraid that in Scotland this will become an all too familiar event.